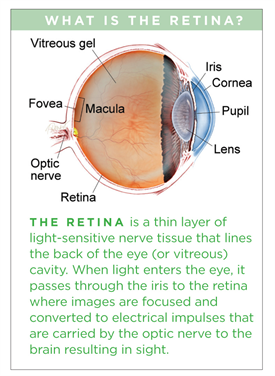 The macula is a small area in the center of the retina where light is sharply focused to produce the detailed color vision needed for tasks such as reading and driving. 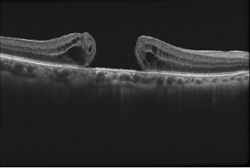 When a full-thickness defect develops in the macula, the condition is referred to as macular hole. The most common symptom of macular hole is a gradual decline in the central (straight-ahead) vision of the affected eye. The degree to which vision is affected will depend on the size and location of the macular hole, as well as the stage of its development. Macular hole commonly affects people over the age of 55 and most often occurs in women. The vast majority of cases develop spontaneously without an obvious cause. For this reason, there is currently no effective way to prevent their formation and development. If a macular hole develops in one eye, there is a 5% to 15% risk of one developing in the other eye. Vitreous traction: the vitreous is the “gel” that fills up the inside of the eye. With normal aging, the vitreous can shrink and pull away from the retina, sometimes creating a macular hole in the process. Retinal detachment Genetics, environmental factors, and systemic causes don’t seem play a role in macular hole formation. Macular holes are most common in people age 60 or older and seem to be more common in women. Optical coherence tomography (OCT) is the current gold standard in the diagnosis, staging, and management of macular holes (Figure 1). This quick, non-invasive imaging technique allows for evaluation of the macula in high resolution using reflected light, and helps your doctor differentiate a hole from other eye conditions with similar symptoms. No laboratory tests are needed in cases of idiopathic macular holes (those without a known cause). Vitrectomy is the most common treatment for macular holes. In this surgical procedure, the vitreous gel is removed to stop it from pulling on the retina, and most commonly a gas bubble is placed in the eye to gently hold the edges of the macular hole closed until it heals. This image was originally published in the ASRS Retina Image Bank. Eric A. Postel, MD, Duke Eye Center. Traumatic Macular Hole. Retina Image Bank 2012; Image 2858. © the American Society of Retina Specialists. The patient may be asked to maintain a face-down position for several days, and in some cases up to 2 weeks, depending on the characteristics of the macular hole. This will allow the bubble to gradually dissolve and be replaced by natural eye fluids. Vitrectomy has a success rate of over 90%, with patients regaining some or most of their lost vision. Potential complications of the procedure include cataract formation, retinal detachment, infection, glaucoma, bleeding, and re-opening or persistence of the macular hole (less than 10% of cases). 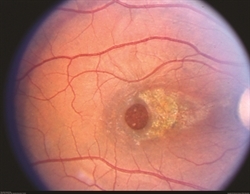 Another potential treatment for some patients with macular holes is the injection of ocriplasmin (Jetrea®) into the vitreous. This drug helps to relieve vitreous traction on some macular holes. In cases where the macular hole is very small and does not have a large impact on your vision, your doctor may not recommend any treatment at all. He or she may simply observe and track the macular hole’s progression or natural healing. In this case, it would be important to have regular follow-up eye examinations as determined by your eye doctor to catch and treat any problems early.